Once again we are in need of your services. Communication satellites destroyed. Disruption of global information flow seriously damaging world economy. Analysts expect further economic and political deterioration. Terrorist organization Geldra claims responsibility. No demands have been made. At this time, Geldra's motives are unknown. Intelligence indicates that rogue arms merchant Gimdo may be involved. We offer the standard contract and disclaimer. Your controller will be JC-KAL, authorization code OMEGA. You will be contacted. Looks like a tough one. After an awkward pause she hangs up. As you oil your 9 mm, you prepare yourself for the task ahead of you. --From the Genesis Rolling Thunder 2 instruction manual. 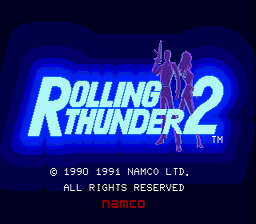 Play Rolling Thunder 2 Now!